The one-way block of Forest Street—narrow, bursting with restaurants, halted during deliveries and drop-offs and home to a newly designated loading zone—will lose 10 parking spaces for a two-week stretch next month and then three separate spaces for about one year, as a widely anticipated building project at number 21 gets underway. Demolition of two buildings there—the former Forest Street Deli and Farmer’s Table (going further back, BMW Lindner Cycle Shop)—starts today (Thursday) and continues through midday Friday. It’s the first step toward what eventually will be a three-story, mixed residential-and-retail complex that will lie roughly between the New Canaan Dance Academy and brick building at the Locust Avenue corner, home to the Board of Education’s administrative offices. 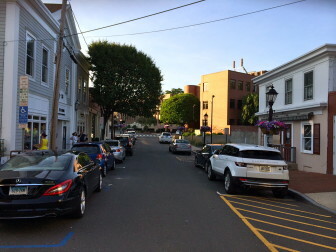 Saying they’re supportive of the overall project and that it ultimately will be good for New Canaan, business owners on the street expressed frustration Wednesday with what they called poor communication about the imminent parking disruption. “The stop-and-drop people who are there with the dance studio and that kind of thing have gotten to a point where Forest Street is clogged up entirely, people can’t park on the street and now we are told today—today—that there will be  more spaces taken out of the loop, which is insane,” Tequila Mockingbird owner Paul Mauk (speaking mostly on behalf of Gates, where he’s a partner), said during a meeting of the Police Commission, held in the New Canaan Police Department training room. The commission oversees on-street parking and is responsible for matters such as road closures. Other business owners expressed concern about dust from demolition work (on outdoor diners), questioned the practical need for so much disruption, raised safety concerns for pedestrians and worried about traffic flow on Forest. Though the project itself has been in the works for years, vetted fully by town officials and opened at public hearings, the nuts-and-bolts of just how the construction would be done and what it would require took some by surprise. “This one seemed to come out like a lightning bolt to everyone on the street, so I am really surprised and rather disappointed in the process, [in terms of] both construction and communication,” said Keith Simpson, owner of Keith E. Simpson Associates and who has worked on Forest for some 30 years. Project manager Bob Fenn said his group is sensitive to neighboring Forest Street businesses. Plans call for a complex with two commercial spaces—at 3,700- and 1,057-square feet, with the larger one on the north side (toward Locust)—as well as seven residential units (five on the second floor and then two larger ones on the third floor), a pocket park and 48-space parking lot. The residential units’ courtyard would include skylights to the commercial plaza below, a stone fireplace and stone-and-wood deck. A storm drain system must be installed in order for the project to move forward, Fenn said, and that means 60 feet of reinforced concrete pipe, a manhole and two catch basins. That work will get done between July 7 and 18, so that it’s finished prior to the July 19 Village Fair & Sidewalk Sale. While it’s happening, Forest Street will become one lane of traffic along the extreme left-hand (western) side of the street for the second half of that one-way stretch. In other words, the parking spaces on the west side of the street from the pocket park to Locust Avenue will become a lane of traffic. Once the storm drain work is done, the construction on the site itself will swallow the three spaces now in front of number 21—though, as Commission Chair Stuart Sawabini noted, once the complex is finished, five on-street spaces will exist where there are just three now (because the curb cuts for the long-empty lot there will be gone). The sidewalk along the west side of Forest—which as M Milestones owner Dan Mulhern said sees the majority of foot traffic and business—will not be removed, altered or otherwise disrupted at any point during construction. Theodore Giapoutzis from New Canaan Diner urged Fenn and property owner and developer Chris Gatto, who also attended the meeting, to work out a non-disruptive system where larger truck deliveries would be scheduled to enter Forest from the Locust Avenue side rather than East Avenue. Department of Public Works Assistant Director Tiger Mann said the logistics on that are difficult. “It’s a much better option, it’s just a question of how do we make sure the street is safe at that time and how long do we need to close it to back a truck in and what have you,” he said. 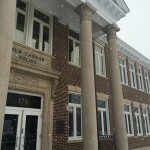 New Canaan Police Capt. Vincent DeMaio said the scheduling itself is tricky and that—given uncertainties around specific delivery times—the cost of staffing an officer to wait may be cost-prohibitive.